Amongst the shadows in the park people go about their day. 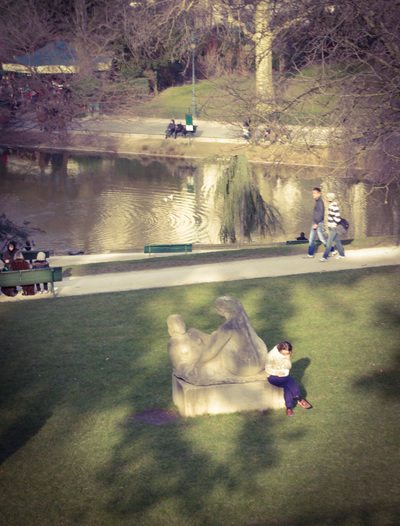 The park conjures up an idea of relaxation and choice. You can sit and read, you can sit and chat with others and you can wander. You may or may not notice the bird life in the park. The birds are going about their day as well. It could be relaxation for them too. Or it could be more like their work perhaps. It is an interesting phenomenon of modern life that we need to seek out places to relax. It can be difficult to relax unless we actively seek out a place and time. Finding a way to relax is like an art. Life's chores and pressures often get in the way of relaxation. We know that we need to have a balanced life but it can be so very difficult to find that balance. Parks are places that remind us that we should and can relax. They are places of pleasure helping us to feel the benefit and wanting to come back again. The shadows in the park can remind us of the shadows in our lives. Sometimes it is difficult for us to relax because of our own shadows. The worries and concerns that keep creeping into our thoughts. Being in a park and feeling the freshness of the air, feeling the grass under our feet and the slowness of time as others wander and sit, can all help us to put the worries and concerns aside. Even for a few moments. Valuing relaxation as a core part of our lives can help us to prioritise it. To build it in as one of the things we do each day. Perhaps having a park near by can prompt us to visit and build a little relaxation into our daily routine. Taking ourselves out to the park at lunchtime can help us to be more productive - just having a lunch break has been found by research to help people work better. It's perhaps unusual that we have to justify our time out. A sign of our busy times perhaps. Seeing life as made up of many aspects can help us to see the validity of relaxation as part of it. Instead of waiting until retirement when relaxation may seem more possible, it can help us to learn to relax now. Retirement may well be too late to learn this art. Building relaxation into our life now may help us to value the journey of life rather than always looking forward to the fantasy of a future when things will be better.